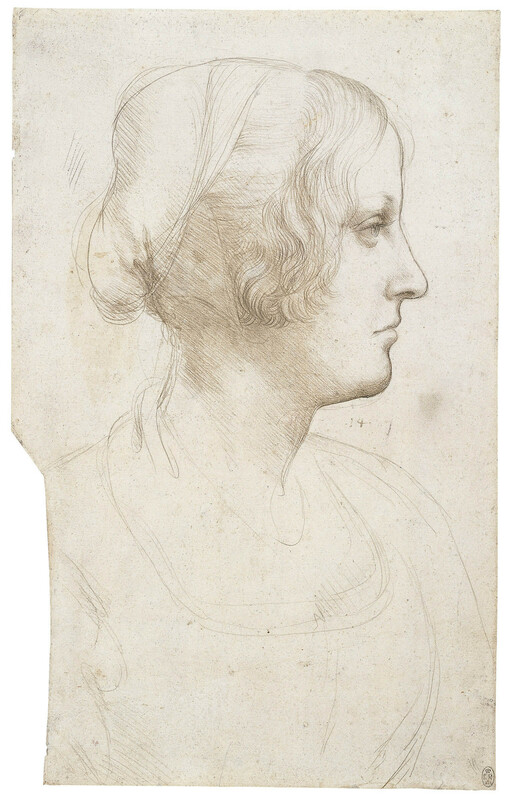 A drawing of the head and shoulders of a woman, turned in profile to the right, wearing a cap on the back of her head. Melzi's 14. Leonardo executed at least five portrait paintings during his career, of which the most famous, the Mona Lisa, is the least typical, for the sitter is there so idealised that she has lost her individuality. This beautiful drawing is wholly different, a rigorously observed study of a young woman in everyday clothing. The sheet was probably drawn not as a preparation for a painting, but as a finished work for Leonardo’s own satisfaction. He has attained complete mastery of the metalpoint, from the rapid sweeping lines that define the bust and the back of the head, to the delicate fall of the hair and the subtle effects of light and shade in the facial features.